In our last post, we looked at some tests done against many early firearms, mostly arquebuses and muskets. While we studied some of the tests, it might be a good idea to actually present some of those results in a bit more detail, so we can understand it better. Examples of arquebuses. Click on the image to enlarge. Public domain image. As was mentioned in the previous post, during 1988 to 1989, staff members of Steiermärkisches Landeszeughaus (Steyr Provincial Armory) in Graz, Austria, conducted tests using 16 firearms dating from 1571 to post-1750, with equal numbers of specimens from the 16th, 17th and 18th centuries. The guns were mostly mass-produced specimens, such as might be typically issued to infantry troops. Three of the weapons had rifling, the others were smoothbore guns. A couple of the guns were rejected after early inspection revealed that they had potentially dangerous weaknesses in the metal. The remaining 14 weapons were test fired 325 times under controlled conditions, in a testing range operated by the Austrian Army. 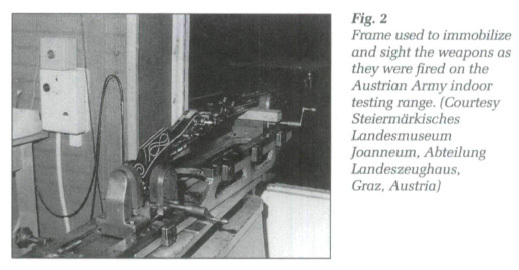 As part of the tests, they also brought two modern production assault rifles and a modern pistol used by the Austrian military, so that they could compare the results against modern firearms. Physical Characteristics of the various firearms. Click on the image to enlarge. Velocity measurements of the various firearms. Click on the image to enlarge. The modern weapons are highlighted in yellow background at the bottom of the images. The "Spanish" weapons are actually made in Austria, but the Spaniards were the first to equip their troops with heavy muskets in the 1520s, which is why heavy muskets of that era are generally called "Spanish muskets", irrespective of where they were actually made. Caliber is actually the nominal caliber of the bullet (i.e the bore diameter). We read something about this when we discussed 5.56 mm. vs. .223 ammunition earlier. Pistol weapons were shot at targets at 30 meters (100 feet) ranges, whereas rifles were shot at targets at 100 meter (330 feet) distances. This is why rifle velocities are measured at both 30 and 100 meters. The first thing we note is that all the older weapons have much larger dimensions than modern weapons. In fact, the only two older weapons that are smaller in length are the two pistols, which are shorter than modern rifles, but not by too much. The modern pistol is much smaller in size than everything else. Similarly, older weapons are generally much heavier than modern weapons, especially the ones from the 16th and 17th centuries. Advances in metallurgy have made it possible for modern firearms to be both stronger and lighter than the ancient firearms. The calibers of weapons have also significantly reduced in modern times. Powder weights are somewhat harder to compare, because the older weapons use black powder, whereas modern weapons use smokeless powders, which are much more efficient in propelling bullets. However, they are still listed above, so that the reader can see how much less weight of powder modern weapons use. Also, note the change in velocities when measured at 30 meter and 100 meter ranges. As we studied in the previous post, round balls lose velocity at almost 3 times the rate that conical bullets do. The modern weapons all fire conical bullets, whereas the ancient weapons all fire round ammunition balls and we can see the results clearly. For instance, at 30 meter range, the FAL rifle only loses 20 meters/sec velocity (835 vs 815 meters/sec. ), whereas the ancient weapons lose velocity a lot quicker. In fact, at 30 meter range, some of the bullets from ancient weapons are slower than that fired from the Glock 17, which had the slowest muzzle velocity initially. At 100 meter range, the velocities of older weapons are significantly less, with many of them travelling at under 300 meters/sec. (about 1000 feet/sec.) This means they also lose penetrative power much more rapidly than modern weapons do. This is the reason why most ancient commanders told their men to not shoot until about 60-70 meter ranges or even closer than that. In our next post, we will look at the same weapons and compare their respective penetrative powers and shot dispersion. "with the exception of the two ancient pistols, which clock in at 385 and 392 meters/sec"